What a unique bow! 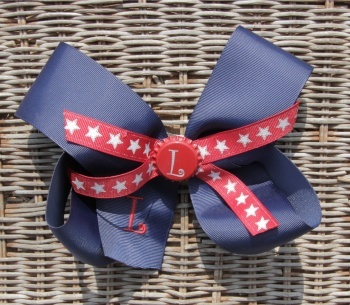 You get a personalized engraved bottle cap in the middle of this wonderful American Patriotic Navy and Stars Hair Bow. The bottom is a 2.25" Navy grosgrain ribbon that has 2 layers of a 5/8" red grosgrain with white shining stars on top. Then you get a red bottle cap with your first initial engraved in the center. The letter will come out a white color and will be done in a Monotype Cursova font. This picture also shows the added embroidered first initial on the front tail, it looks great in red to match perfectly. Add on with one click below or keep it just with the bottle cap engraved, it looks great both ways!